I had a fun time yesterday at the Red Mountain High School STEM Expo. 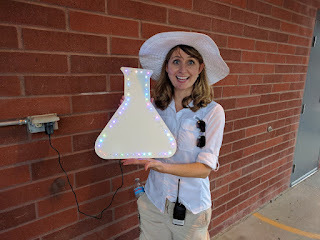 We had a bunch of kids soldering this really cool flashy LED white board sign in the shape of an Erlenmeyer flask. I chose this shape for Barbara Torrey the biology teacher who worked really hard to make this event happen.